Here you will find some tips and reminders so that your trip to Whistler tomorrow is a great one! • You must arrive at the school by 6am. Mr. van der Pauw will be arriving at the school at 5:50am to open up the school. The bus leave at 6:15am sharp and will not wait for late arrivals. If you miss the bus, it is your responsibility to find your way up to the mountain. Refunds are not given for students who miss the trip for any reason. • Leave your snow suits and other warm items in your bag. Getting overheated can lead to you feeling sick. • Have a good breakfast and pack a healthy lunch. • If you get car sick easily, make sure you have things you can take to make the trip more comfortable. Taking natural gravol with ginger can help calm the stomach. • Don’t forget anything. Packing with a list and doing it the night before really helps. • Layer up. Wear breathable, layered clothing. No Jeans. • No electronics. Leave your devices at home. • We will notify parents of any delays or changes in the trip via the classroom reps. We are expected to be back at the school at 6pm, however traffic is unpredictable. • Put your name on your gear. Students who are renting will receive everything they need to have a great time on the mountain (snowboarding/skiing equipment, helmet, and a GPS unit). They will not receive goggles. Re-registration packages were sent home. Re-registration day will take place on Friday, February 1st 8:00am – 7:00pm. There is a $25.00 per student late fee for any re-registrations packages that are not submitted on February 1st. A few changes are in place, you MUST pre-pay the Application/Registration fee of $150.00 (per family) prior to Tuesday, January 29th through the Munch A Lunch program. Also, there is a $25.00 fee for individual comfort kits which must be paid prior to Tuesday, January 29th. Thank you to everyone who attended our annual Family Bingo Night. It was another great success. I would like to thank all those involved in the preparation and running of the event. We looking forward to running this again next year. Soon we will be reaching out to the wider community asking for admissions for our 2019-2020 Kindergarten class. We currently have space in Kindergarten for approximately 8 more students. We are pretty much full in every other class. 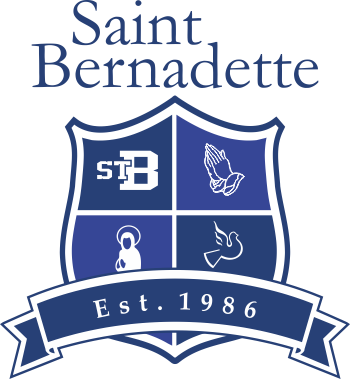 If you know of someone who would benefit from attending St. Bernadette’s, please pass along our website and information so they can fill out an application form. Re-registration packages will be sent home early next week. Re-registration day will take place on Friday, February 1st 8:00am – 7:00pm. A few changes are in place, you MUST pre-pay the Application fee of $150.00 prior to Tuesday, January 29th through the Munch A Lunch program. There is a $25.00 fee for individual comfort kits (see attached letter) which must be paid prior to Tuesday, January 29th. The Ministry of Education requires schools to issue 5 formal reports to parents each school year. At St. Bernadette’s we report out through 2 conferences and 3 written reports. This year, to align more fully with new curriculum standards and reporting practices, we are modifying our written reports. There will be 2 summative reports (now known as Communicating Student Learning [CSL] Reports) and 1 formative interim report. The interim report will be very similar to the summative reports. The main difference is that the interim report will focus mainly on the core subject areas. In addition this this, the school will be phasing out letter grades. Many school are taking the leap to remove them all together this year, however we have decided to do this gradually. Starting this year, only grade 6 and 7 will receive letter grades. They will be in the areas of Language Arts, Math, Social Studies and Science. Next year we will not have letter grades in the school. Many high schools, including Holy Cross, are making similar changes when it comes to letter grades. On behalf of St. Bernadette School we would like to thank everyone for their involvement in our annual Lights of Hope event and the school Christmas Concert. We would especially like to thank Mr. Paul Lylyk and Ms. Cathy Lan for their time and effort in organizing the Lights of Hope. We would like to thank Fr. Paul for providing the blessing. We would like to thank Mr. Danny Guererro for providing the sound and lights for the Christmas Concert. Many thank to all the teachers, staff and parents who worked on preparing the students, making props and creating costumes. A very special thank you to Ms. Heaman for all her efforts in putting on the Christmas Concert. If your child(ren) will not be returning for the upcoming school year 2019-2020, please advise the office at your earliest convenience. Re-registration will take place on Friday, February 1st, from 8:00am – 7:00pm. Re-registration packages will be sent home sometime after the Christmas Break. The application fee remains at $150.00 and is to be paid prior to February 1st through the Munch A Lunch program. We WILL NOT be accepting payment on February 1st, you must pay prior to re-registration. St. Bernadette School donates to several charities throughout the year. So far this year we have donated to food items to the St. Vincent De Paul Society, $1159.00 to the Holy Childhood Association and $385.55 to Covenant House. We are currently raising money for Chalice through our gently used household item sale hosted by Grade 6. We would like to thank you for your generous contributions and look forward to your continued support. Thursday: Christmas Colour Wear Day – Arrive to school in your favourite Christmas colours. Students will be invited into a Christmas fun house in the library learning commons. Friday: Ugly Christmas Sweater Day – *Students whose clothing may cause distractions, are asked to refrain from wearing it to Church and to put it on after Mass* Come to school wearing your creative, craziest, most fun Christmas sweaters and clothing. After recess we will watch a Christmas movie and have a sing-a-long. The Stingers Club will be available on Friday, December 21st from 12:00pm to 6:00pm, please contact Sheila at stingersclub@stbernadette.ca to advise her if you will be needing Stingers Club. For those who are already registered there is an extra $10.00 fee. Tomorrow is the last day that the Grade Six class will be selling gently used household items, candles, games and toys. Items are priced between .50 and $5.00. This is a great opportunity for students to purchase gifts for family members. The money will be donated Chalice. We are asking for all school families to please donate items & participate in this very special fundraiser. Please drop off items to the Grade 6 classroom as soon as possible. If you have a child who was born in 2014 and will be attending St. Bernadette School, it’s time to notify the school office so that we can keep a space open for your child. It is very important that we have an accurate numbers of siblings for Kindergarten.